This morning when I signed onto Facebook I was greeted with the news that my niece's cat, Dottie, had passed away. Her comment thread spoke of how much of a wreck she was; how sad she felt. Later this afternoon, my brother called me to let me know that their dog of 16 years, Katie, was being put down today. He was on his way home where the vet was waiting with the family. He was shaken and in emotional pain. Just as my niece, today was a day they were both losing dear friends. People who have never experienced the love of an animal, or their loss seem to have difficulties comprehending how we feel as though a family member has passed. I say unless you have gone through it, you cannot judge. It's like people who have never had children that tell those that do how to raise them, or take care of them. They are clueless. 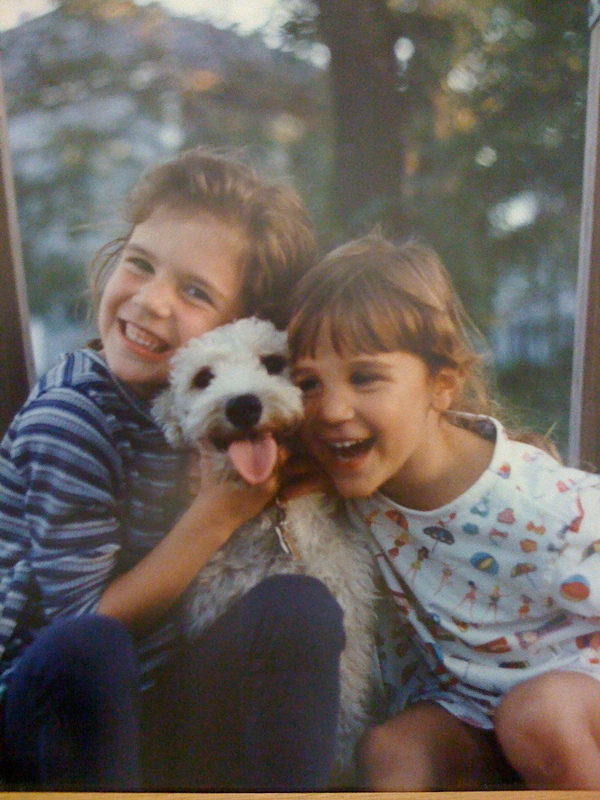 In April of 1993, a white 5 month old schnoodle came into our lives. I remember so vividly the day we brought him home. My husband had already seen him at the pet shop and as a surprise, along with my girls then 3 and 5 went to bring him home. We were completely clueless what to do with this little white ball of fur, so soft and precious. Along the way home we decided that his name would be Sammy. I have no idea how we arrived at that name but it fit perfectly. And speaking of fitting perfectly, Sammy was the best addition to our family imaginable. He trained quickly and was smart as a whip. He was loving, affectionate and obedient. Everyone in our neighborhood knew Sammy as he had a sneaky habit of letting himself out the front door. He'd run around and then there he would be, sitting at the front door. He knew where home was. Sammy was a joy to have when the girls were growing up. He was playful, sweet and a great watchdog. He may have been small but he would rip the arm off of anyone who would hurt one of us. He was such a pleasure that friends would be more than happy to watch him when we would go on vacation. He was that good. Since I work from home a good deal of time, I was with Sammy more than anyone. He always sat in my office with me, was always waiting at the door when I came home. My daily welcome of "Hey Sammsers" or "Hey Muttley" were always words of love from me. I wasn't the most physically affectionate with him, but I loved him deeply and truly. I referred to him as my son. On the morning of June 30, 2008 when Sammy was 15 years old, we awoke to him bleeding on the carpet of our family room. He had had a rough weekend yet we just never wanted to believe the end was near. 15 years, he was our family member, our companion, our best little buddy. Luckily we were all home and at 8 that morning we rushed him to the vet. We were told that it would be best to put him down. It was a shock we were not prepared for and the Dr. suggested that we each take a private few moments with him before she did what she had to do. The idea that I would go home without our Sammy was incomprehensible. We were all inconsolable; a sadness that we had not yet felt in our lives. None of us had experienced the death of a family member at that time and it was an awful, new feeling. One that I really never thought would be quite that deep. All of us came home with the emptiest feeling. Sammy was to be cremated and when I picked up his remains, which took me weeks to get up the courage, I cried like a baby in the vet's office again. His tin sits in a place of prominence in our home. When I look at it, I am reminded of our "little boy" and what he added to our family. Shortly after he passed, my husband bought me a plaque that reads "Dogs leave pawprints on our hearts". There is no truer statement. Whether it be a dog, cat or another animal they become a part of us, a part of our families. They have big hearts and are our unconditional best friends. There are few of those in the world. Sometimes they are all we have. RIP to Dottie, Katie, Sammy and all our furry friends we have lost. I'm Heidi and I read your story about Sammy, your brother's dog and your niece's cat and wanted to respond. It brought tears to my eyes when I read about Sammy being put down and you had to pick up the ashes. My cat Joshua died almost six years ago now. He was twenty and I had to put him down due to kidney failure. He was just so sick. It's funny that you called Sammy your son because I used to call Joshua my furry son. I'm epileptic and he used to stay with me after a seizure and let me rest my head against him. His purring eased my pain. On the day he died, I took him to the vet and usually he offered resistance. There was none. He just curled up on the table and waited. I promised him that I would stay with him while he got all the needles so I did. I had paid before the procedure was done because I knew I would be a mess. I sat in front of him, he got one needle, then another and finally the last and he was gone. I asked the vet if it was over and he said yes. (I'm crying now) I held my little boy and told him how sorry I was. I wished I could revive him. But he was so sick. I couldn't let him suffer. I had him cremated and his ashes are in an urn in my bedroom. It has Joshua B. Kitty on the front. I used to call him the bunny kitty. It's funny, I didn't know a little cat could make me cry this much. Six years later and I still cry. When I got his ashes back, I was actually happy to have them because I would have him back in any way, shape or form I could. It was like his spirit was back with me. The year he died was a really bad year. In addition to losing him, I lost my sister in law, three friends, my father and then my mother. My father had abandoned us so I didn't even go to his funeral and we didn't know for a month after he died that it had happened. But my mother was an entirely different story. I cried buckets then. And I didn't have Joshua for comfort. I was a mess. I wish you could have known him. He was a really good boy. One day, he said hello and somehow he learned the word mama and used it a lot. I used to tell him Mama loved him all the time. It's amazing how fur kids add so much to our lives. I also read about your bullying. I was bullied too and one of the people on the block used to threaten to steal my bike. It had my name written all over it. My mother bought it for me. I was so scared, I kept hiding the bike and my mother would ask me why I wasn't riding it. She gave it away. I finally told her that Peter kept threatening to steal it so I kept it hidden. I however was suicidal when I got bullied, I got it in school and at home. So, there was no refuge. I'm better now and one of the kids from my grammar school that used to bully me apologized for it. I got in touch with him cause I found out he tutors people, he came to meet me and we had a chat outside. I sent him an email and it turned out that he wanted to meet outside because he was afraid I would make a scene. But he really wasn't the main person. He had been feeling guilty all those years. But, I have a friend now in him. It was nice and healing how that one worked out. He was nervous about seeing me again because of it. Anyway, I like your writing, I'm sorry about Sammy and the bullying you went through. Have you heard the poem about the rainbow bridge where pets go after they pass? Thanks so much for sharing your experiences. No, I have not heard the poem but I would love to, please share! And thanks for your kind words.